The word "e;elegy"e; comes from the Ancient Greek elogos, meaning a mournful poem or song, in particular, a song of grief in response to loss. Because mourning and memorialization are so deeply embedded in the human condition, all human societies have developed means for lamenting the dead, and, in "e;That the People Might Live"e; Arnold Krupat surveys the traditions of Native Amer… ican elegiac expression over several centuries.Krupat covers a variety of oral performances of loss and renewal, including the Condolence Rites of the Iroquois and the memorial ceremony of the Tlingit people known as koo'eex, examining as well a number of Ghost Dance songs, which have been reinterpreted in culturally specific ways by many different tribal nations. Krupat treats elegiac "e;farewell"e; speeches of the eighteenth and nineteenth centuries in considerable detail, and comments on retrospective autobiographies by Black Hawk and Black Elk.Among contemporary Native writers, he looks at elegiac work by Linda Hogan, N. Scott Momaday, Gerald Vizenor, Sherman Alexie, Maurice Kenny, and Ralph Salisbury, among others. 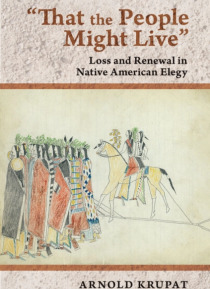 Despite differences of language and culture, he finds that death and loss are consistently felt by Native peoples both personally and socially: someone who had contributed to the People's well-being was now gone. Native American elegiac expression offered mourners consolation so that they might overcome their grief and renew their will to sustain communal life.